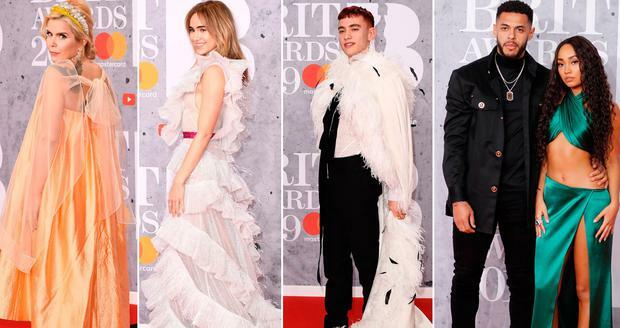 Dare I say it - was the Brits red carpet actually interesting this year? There's been something looming in the air this awards season - something that is, dare I say it, actually a little bit exciting? It can be said without too much debate that the Brits, the UK’s rival to the Grammys, has lost its lustre in recent times. Year after year, the Brits guestlist has been reduced to B-list-at-best, thanks in part to an increase in competition and an unwillingness to adapt to change. Last year was all about choreography with most of the focus on Cheryl Cole and Liam Payne, as they intended. They arrived arm-in-arm protesting a little too much about their relationship status after it was reported they were headed for a split (which they did just a few weeks later), overshadowing much of the other acts who were lesser known than they. It became more about celebrity and less about the music. 2018’s entertainment events were also ones rooted in politics: awards season coincided with the height of the #MeToo movement on both sides of the Atlantic and while actresses in Hollywood wore black to the Golden Globes in solitary, singers arrived to the Brits carrying white roses in support of Time’s Up, which campaigns against sexual harassment and assault. That support was necessary, if a bit hollow, and poorly executed as no one thought to notify media in advance the symbolism of the white roses and most were left scratching their heads when the pictures arrived in of celebrities holding what appeared to be random flowers. This year, however, there was something interesting all its own on the red carpet – instead of aligning to politics, artists expressed their individuality in genuine, creative ways through their clothing. As a rule, Little Mix aren’t particularly exciting, but I found myself sitting up to take note as they walked the red carpet in matching pink leather ensembles, an homage to the glory days of pop when Destiny’s Child broke the mould in similar styles in the noughties. Paloma Faith arrived in a golden vintage style dress - by Irish designer Simone Rocha nonetheless - and Abbey Clancy, whose attendance still hasn’t been explained, arrived clutching her baby bump posing as awkwardly as possible in order to ensure the photographers got what they needed. Natalie Dormer wore jeans. Suki Waterhouse wore a plunging ruffled gown. Winnie Harlow wore Elie Saab. It was as if they were all dressed for a different event and the results were spectacular. 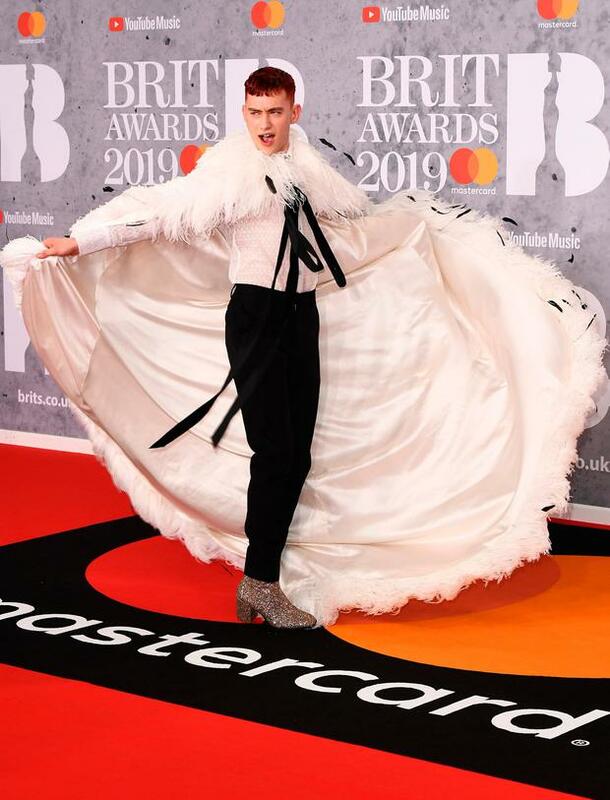 The undoubted king of Wednesday’s red carpet was Years & Years frontman Olly Alexander, who posed self-assuredly in a feathered white cape by Palomo Spain in an arrival with just the right amount of drama. Inside the ceremony, Hugh Jackman opened the show with performances from The Greatest Showman – a surprise runaway musical hit which doesn’t exactly fit in with the Brits’ too-cool image and was thus a genius addition. 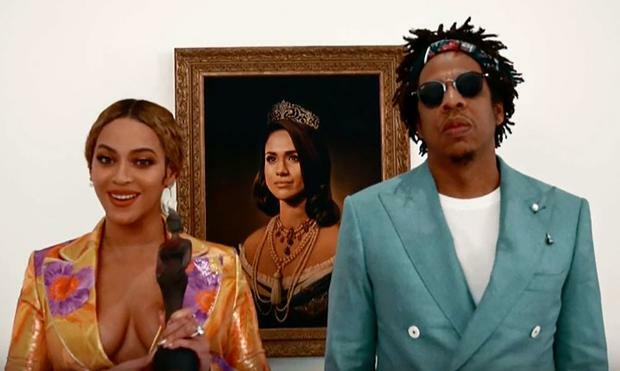 And Beyoncé and Jay-Z accepted their award in front of a portrait in which Meghan Markle is painted as a queen in honour of Black History Month. Newer artists like Dua Lipa, who won Best British Single, arrived in a plunging black lace bodysuit with a voluminous pink ballroom skirt which divided fans and P!nk looked uncharacteristically low-key in a yellow Cushnie dress with black biker jacket. The fact that the night was full of surprises was the biggest surprise of all – and a welcome one. Sorcha O'Connor Brian O'Driscoll and Amy Huberman made a stylish appearance at the opening night gala for the Virgin Media Dublin International Film Festival.